As a ten-year-old self-proclaimed “child freak,” she acted out her fury at her boxy hearing aids and Coke-bottle glasses by faking her own drowning at a camp for crippled children. Ever since that first real-life performance, Galloway has used theater and performance-onstage and off-to defy and transcend her reality. With disarming candor, Terry writes about her mental breakdowns, her queer identity, and her life in a silent, quirky world populated by unforgettable characters. What could have been a bitter litany of complaint is instead an unexpectedly hilarious and affecting take on life. "Like discovering a lost Sedaris, this is the kind of writing that encourages laughing and reading out loud." "When Galloway was 10, she proclaimed herself a "child freak," and by the standards of the world around her she wasn't wrong. Deaf with bad eyes and queer with a hard sense of humor, Galloway's account of her survival induces the most uncomfortable laughter of the season." "Told with understandable rage, quirky humor, and extraordinary humanity, this remarkable woman’s engaging account deserves a large readership." 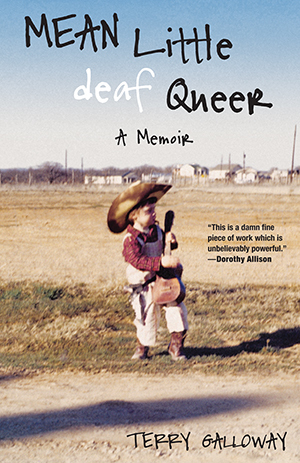 "A frank, bitingly humorous memoir."